Americans are becoming increasingly concerned about the use of Genetically Modified Organisms (GMO) in their food, and with good reason. Environmental concerns over the corporate “mono culture farming” methods used to produce these foods, as well as a potential increase in allergic reactions, are causing some to second guess their shopping choices. As a result of these concerns, many Americans have been demanding that food containing GMOs be labeled appropriately. Fair labeling has always been a means in which Americans can not only keep manufacturers honest, but be allowed to choose what is ingested into their bodies. 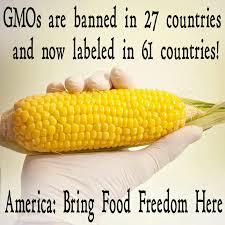 Unfortunately, GMO labeling has not yet happened in the United States. In fact, major US corporations associated with GMOs have gone out of their way to keep food containing GMOs from being labeled. Millions of dollars have been spent purchasing air time and employing “experts” who claim that, “there is no need to label GMOs” as “they are perfectly safe,” when the reality is that the safety of these products has not yet been proven. A 2012 Mellman Group poll found that 91% of American consumers wanted GMOs labeled, and according to a recent CBS/New York Times poll, 53% of consumers said they would not buy food that has been genetically modified. The movement to label these potential hazardous ingredients is a familiar concept. In fact, 27 countries have banned GMOs, and 64 countries have passed laws to require that any product containing GMOs be labeled appropriately. So the claim that “there is no need to label GMOs because they are perfectly safe” is most definitely still up for debate and raises an obvious contradiction: If GMOs are in fact safe, why not label them? Why not proudly advertise when foods contain their proclaimed “world saving” ingredients? Why spend millions to prevent people from knowing what’s in their food? That is a question that Americans need to consider. One reason that major food companies are so opposed to GMO labeling is that many people are ignorant of the fact that GMOs are being used in their food. Many are still blissfully unaware of what GMO actually means or what is entailed in producing GMO foodstuffs. For example, using known harmful pesticides like Glyphosate, or the methods used in creating a GMO in the first place. Most are unfamiliar with the process of DNA splicing, which is used to produce these products. The DNA of one species is extracted and artificially forced into the genes of an unrelated plant or animal. The foreign genes may come from bacteria, viruses, insects, animals or even humans. Because this involves the transfer of genes, GMOs are also known as “transgenic” organisms. The more one looks into the process involved in creating these GMO foods, it becomes clear why GMO labeling is being fought so strenuously by the companies that use them in their products. Corporate executives of companies that use GMOs in their food are aware that if consumers saw a “Contains GMO” label on their favorite box of cereal or pizza, it just might make them want to know what GMOs are, or worse, choose another brand. What can the individual do to make a change in the current situation? It has become painfully clear that the electoral process does not work. Big business will always have the advantage, with the ability to spend as much as is needed to get the votes necessary to maintain the status quo. What most do not know is that the answer is already available on every organic product. For food to be labeled “Organic” it has to go through a vigorous certification process. If a grower maintains specific practices, and is granted the organic label, then one can safely assume this product is GMO free, because the use of genetic engineering, or genetically modified organisms is prohibited in organic products. However, A non-organic product labeled “GMO free” may not be truly free of GMOs. Unfortunately, “GMO free” and similar claims are not legally or scientifically defensible due to limitations of testing methodology. The risk of contamination to seeds, crops, ingredients and products is too high to reliably claim that a product is actually “GMO free.” The Non-GMO Project is the only organization offering independent verification of testing and GMO controls for products in the U.S. and Canada. With this knowledge in mind, it seems unnecessary to seek GMO labeling when Americans already have a labeling system at their disposal in all truly organic food. Those with the desire to pursue a GMO free diet can use the labeling system already in use and assume that if the food does not have the “100% Organic” label, that it contains GMOs. This would allow those adamant about the cause, to avoid all non organic foods, effectively boycotting GMO products. Instead of falling into the trap of debating the issue of GMO labeling, one can use consumer power and choose to stop buying GMO and non organic food. One can choose to spread awareness and get others who care about the issue to do the same. After all, if enough people stop buying GMO food products, corporations and food producers will simply stop using them. History has shown that boycotts can work, and if there is one thing corporate America responds to, it’s money; affect their profit, and enact change. Brian is a writer of articles, essays and short stories. He has a passion for the truth and the people's right to know it. He is also a musician who has performed all over the world in many different venues. He was the first "Head Music Analyst" for the internet start up company called "Savage Beast Technologies" which later went on to become "Pandora Internet Radio." Brian currently lives in Spokane, Washington.